New product innovation is a tough business. You don’t get to decide what customers want, or how fast your market grows, or if the laws of science permit a breakthrough product. 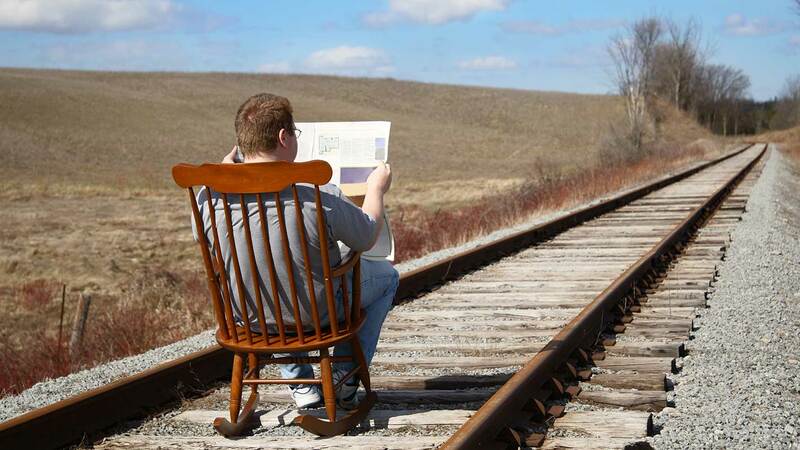 But you can decide how much commercial risk you’d like to absorb… if you are a B2B supplier. This isn’t as true for B2C. Good luck asking consumers to predict what they’d like in a snack food or computer game. You have to build a prototype and get consumer reaction to it. And even then, consumer tastes can be fickle. But imagine your market is “very B2B,” with a high B2B index. (You can measure this for free at www.b2bmarketview.com). Because customers have high knowledge, interest, objectivity, and foresight, they can tell you exactly what outcomes (desired end results) they want and why. There are many ways to reduce commercial risk, but five critical steps will do most of the work for you. Pursue the first four before you start heavy development stage spending, or you’ll risk wasting R&D. It might make sense to skip some steps, but you should understand the risks of doing so. It might make sense to skip some steps, but you should understand the risks of doing so. 1. Qualitative, divergent interviews. In the Blueprinting process, these are customer-led Discovery interviews. You use world-class listening, probing, and triggering to learn all their desired outcomes. 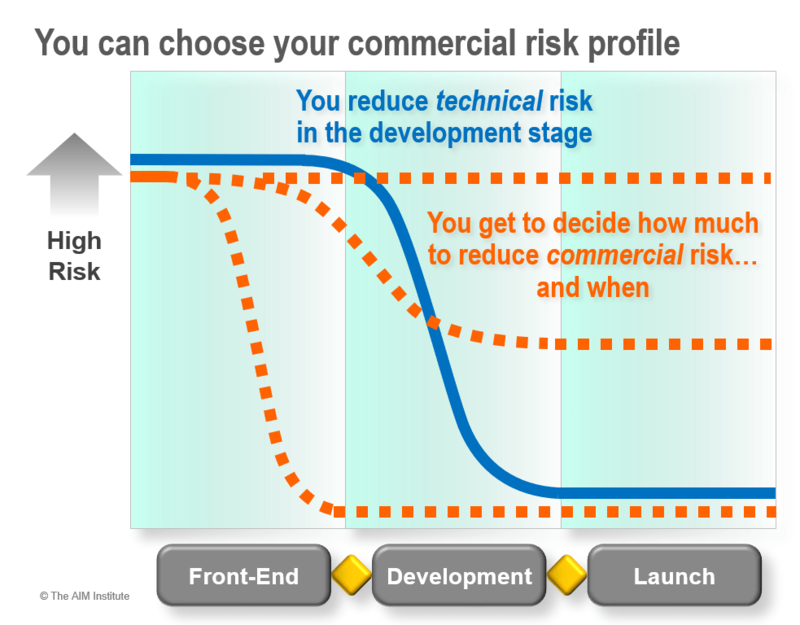 Your commercial risk plummets when you interview a) multiple customers, b) all relevant customer job functions, c) companies down the value chain, and d) key players in the market ecosystem. Risk of skipping: You may incur errors of omission, failing to uncover important, unarticulated market needs. And you won’t even know it… until a competitor introduces a blockbuster. Risk of skipping: You have a good chance of suffering errors of commission. This is pursuing the wrong outcome(s), due to pre-conceived notions, wishful thinking, and confirmation bias. 3. Competitive benchmarking. In solid B2B front-end work, you understand how customers measure outcomes, so you can replicate their experience in your lab or operation. You use this knowledge to assess a) any current products of yours, b) competitive products, and c) your proposed new-product design. Risk of skipping: You’ll probably sub-optimize your new product’s price. Premium pricing is dictated by your product’s value over the next best alternative. Few companies quantitatively understand this. 4. Value calculator. B2C producers use surveys to ask customers for price decisions, but you must understand price decision-making. Why? B2B customers won’t answer your pricing questions honestly since you’ll use this information against them later in negotiations. So you must gather economic data during interviews and tours, to model with a value calculator the benefits your product will deliver. Risk of skipping: Without this (and step 3), you’ll likely leave money on the table with your pricing. You’ll also struggle raising customers’ perceived value up to the true value of your product. A patent is just the legal suppression of customers’ next best alternative. 5. Patent protection. Many think patent protection is a technical issue, but it’s really about reducing the commercial risk of lost opportunity. A patent is just the legal suppression of customers’ next best alternative. It is critical to establishing and retaining your new product’s premium pricing. Risk of skipping: You could put enormous profit potential at risk. Consider the impact on your business if you retain premium pricing for 20 years… versus 2-3 years if your product is imitated. How do we decide our effort level? I promised a “formula” to help you decide how much effort to put into your front-end of innovation. Research by the American Productivity and Quality Center found most companies spend less than 10% of their NPD budgets on understanding customer needs… with 90+% spent on developing solutions. They also found that companies spending 20-30% on the front-end were more successful. So what if you targeted 20% of your project spending on front-end work? 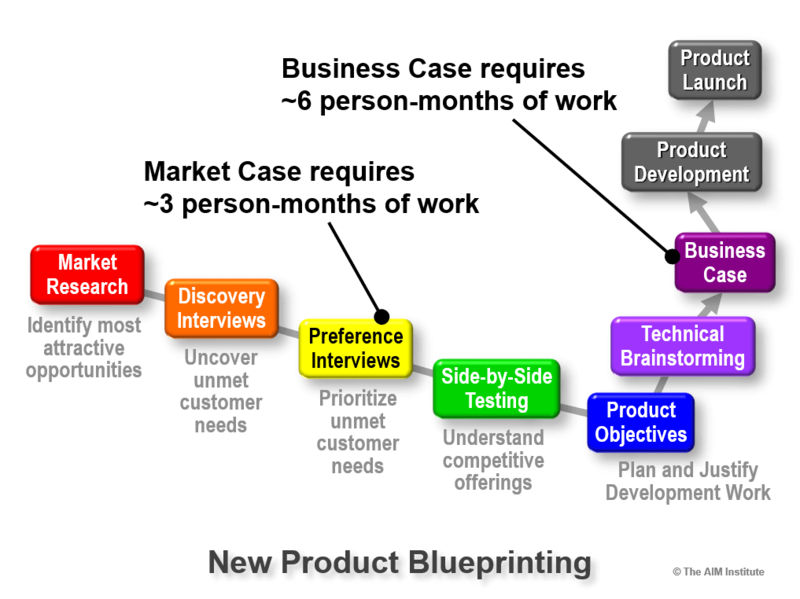 In the New Product Blueprinting process, users create a Market Case after their interviews… and a Business Case before entering the development stage. When we work with Blueprinting teams we see this approximate workload: Delivering a Market Case (after interviews) takes about 3 person-months of effort. Delivering a Business Case (completion of the front end) takes roughly 6 person-months of effort. If you think your project will take 12 person-months of product development R&D (e.g. engineering, or labwork) then delivering a Market Case matches our target of 20% for front-end spending: 3 months divided by 15 months total. And 24 person-months of R&D would justify a Business Case: 6 months divided by 30 months total. You can “adjust” this formula up or down by examining your own new product success rate. 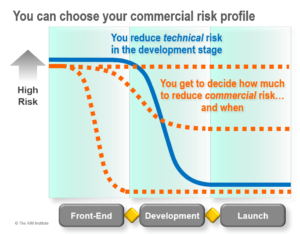 How many products fail due to commercial risk vs. technical risk? If you’re unhappy with the commercial risk you’ve been absorbing, it may be time to exercise your “B2B advantage.” Your smart customers can tell you what they want when you know how to ask. Think of front-end work as an “insurance policy,” where your “premiums” are never wasted. 1. Commitment: When your management sees indisputable, quantified evidence of customer needs, projects are accelerated with better funding and single-minded purpose. 2. New outcomes: Even if you understood some desired market needs, it’s common to find additional customer outcomes… making your product even more valuable. 3. Engagement: Since publication of landmark research in SPIN Selling, we’ve known that asking customers about their problems promotes engagement and future sales. 4. Messaging: You can use your front-end benchmarking—based on customer-centric test methods—to show the competitive advantages of your new product during launch. 5. SEO: Data-mine your interviews to learn the precise language customers used, and then build much better Search Engine Optimization into your online marketing. So is this type of front-end effort “too much work”? It certainly can seem so, when compared to “how we do things today.” But if you want to understand market needs better so you can boost organic growth, perhaps you should do things differently. You may be thinking, “Wait… I don’t remember learning about a Market Case when I took my New Product Blueprinting training.” Your memory isn’t failing you: This is a concept we’ve been applying more recently. If you’d like to discuss this—or the exciting plans we have for developing Blueprinter® software around this—just contact us. If you want to add rigor to your front-end of innovation, you must establish metrics. As Peter Drucker said, “If you can’t measure it, you can’t improve it.” Check out our Commercial Confidence Index (CCI), described in the article, Two new innovation metrics… and why you need them.